The nameless narrator is a traveling automobile company employee who suffers from insomnia. His doctor refuses to give him medication and advises him to visit a support group to witness more severe suffering. The narrator attends a support group for testicular cancer victims and, after fooling them into thinking that he is a fellow victim, finds an emotional release that relieves his insomnia. He becomes addicted to attending support groups and pretending to be a victim, but the presence of another impostor, Marla Singer , disturbs him, so he negotiates with her to avoid their meeting at the same groups. After a flight home from a business trip, the narrator finds his apartment destroyed by an explosion. 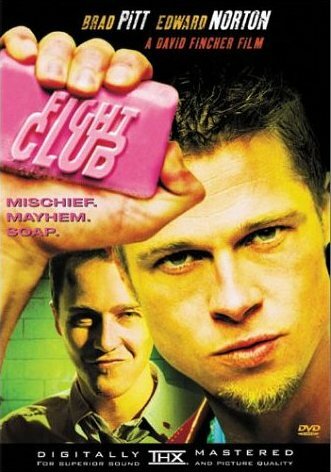 He calls Tyler Durden , a soap salesman whom he befriended on the flight, and they meet at a bar. A conversation about consumerism leads to Tyler inviting the narrator to stay at his place; outside the bar he requests that the narrator hit him. The two engage in a fistfight, and the narrator subsequently moves into Tyler's dilapidated house. They have further fights outside the bar, and these attract a crowd of men. The fighting moves to the bar's basement where the men form a "fight club". Marla overdoses on pills and telephones the narrator for help; he ignores her, but Tyler answers the call and saves her. Tyler and Marla become sexually involved, and Tyler warns the narrator never to talk to Marla about him. More fight clubs form across the country, and under Tyler's leadership, they become the anti-materialist and anti-corporate organization called "Project Mayhem". The narrator complains to Tyler that he wants to be more involved in the organization, but Tyler suddenly disappears. When a member of Project Mayhem is killed by the police during a botched sabotage operation, the narrator tries to shut down the project, and follows evidence of Tyler's national travels to track him down. In one city, a Project member greets the narrator as Tyler Durden. The narrator calls Marla from his hotel room and discovers that Marla also believes him to be Tyler. He suddenly sees Tyler in his room, and Tyler explains that they are dissociated personalities in the same body. Tyler controls the narrator's body when the narrator is asleep. The narrator blacks out after the conversation. When he wakes, he discovers from his telephone log that Tyler made calls during his blackout. He uncovers Tyler's plans to erase debt by destroying buildings that contain credit card companies' records. The narrator tries to contact the police but finds that the officers are members of the Project. He attempts to disarm explosives in a building, but Tyler subdues him and moves to a safe building to watch the destruction. The narrator, held by Tyler at gunpoint, realizes that in sharing the same body with Tyler, he himself is actually holding the gun. He fires it into his mouth, shooting through the cheek without killing himself. Tyler collapses with an exit wound to the back of his head, and the narrator stops mentally projecting him. Afterward, Project Mayhem members bring a kidnapped Marla to him, believing him to be Tyler, and leave them alone. The explosives detonate, collapsing the buildings, and the narrator and Marla watch the scene, holding hands.